Death stalks the lands of Iparsia. 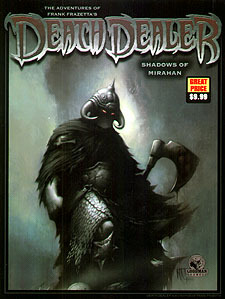 An epic adventure of dark fantasy, magic, and horror, Shadows of Mirahan brings the savage world of Frank Frazetta's Death Dealer to life with setting details, rules variants, and pre-generated characters. When the armies of good have all fallen, and the last citadel burns in the night, will your heroes have the courage to rise against the shadows of Mirahan?